Buzz. Image courtesy Kate Barry. Feel like kicking these freezing cold mornings to the curb? Winter might have wrapped its icy grey mitts around Brisbane for the moment, but if you're looking for a breath of fresh summery air, head out to Wild Canary for the Elsewhere exhibition by Kate Barry. A bird in the hand ... Author image. Elsewhere by Kate Barry is a riot of bright colours and organic shapes, and a welcome reminder of the lightness and brightness that lies just around the corner. Barry's bold, intuitive and innovative works are rich in pattern and texture, and will be on display at Wild Canary until 16 August 2015. Bubble. Image courtesy Kate Barry. Barry says everyday objects fascinate her as much as the beauty of natural landscapes. 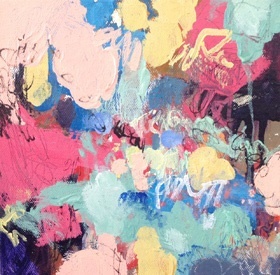 'I find inspiration in the visual facets of construction and destruction,' she says. A Brisbane-based artist, Barry has more than 20 years' experience as a graphic designer. She worked extensively in the book publishing industry before being drawn to create her own artworks. Her works have sold extensively throughout Australia, and also in New Zealand, where she spent her childhood. Barry says the chaos of family life interspersed with rare tranquil moments provides the energising balance that translates into art. 'Running has always been my escape and I find inspiration in the light, patterns, colours and shapes I see and snap (photos) as I run,' she says. Surrounded by towering stands of bamboo and other tropical plants, Wild Canary is a fully licensed botanical bistro nestled in a beautiful garden setting alongside the award-winning Brookfield Garden Centre. Too good to share: pistachio, pear and chocolate cake. Author image. We enjoyed an afternoon out of the cold winter rain here, ensconced on the large back deck, with a steaming pot of tea and generous slices of cake - both carrot; and pistachio, pear and chocolate. 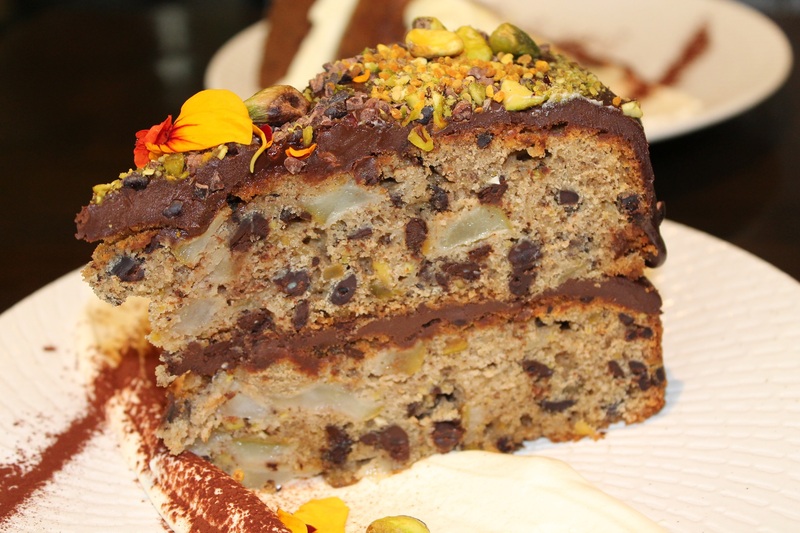 In a simple but inspired touch, the cakes arrived scattered with edible flowers which are grown alongside fragrant herbs and other seasonal produce in Wild Canary's neighbouring kitchen garden (which is nurtured according to organic, permaculture and biodynamic principles). 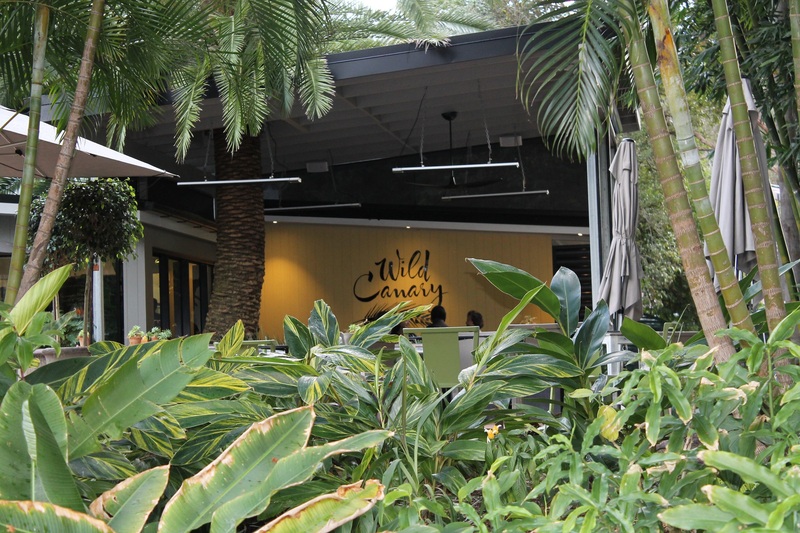 The lush setting serves as both inspiration and temptation to diners who must wander back to the carpark through the Brookfield Garden Centre offering a full range of plants, pots, garden ornaments, gift items and more. 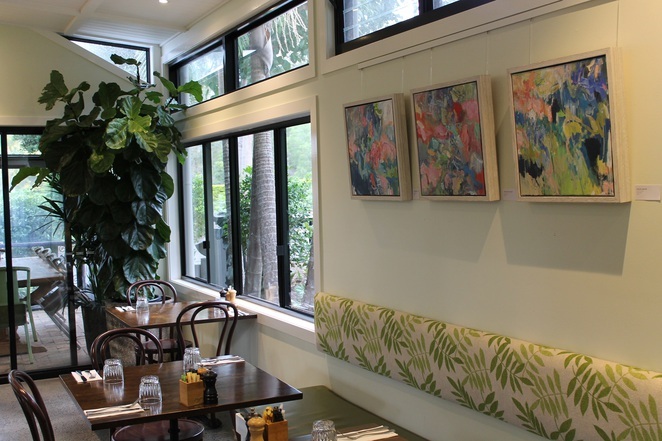 Wild Canary's lush and leafy interior - with Kate Barry art on the walls. Author image. When: Mon, Wed and Thur (8.30am to 3.00pm), Fri, Sat and Sun (8.30am to 4.00pm), Closed Tue.